800 React fans came to Berlin for in-depth talks and hands-on workshops by 24+ speakers on all things puzzling React developers minds, be it architecture, Design Systems or styling in React. Check my takeaways from the conference. Why and how to use React Hooks? The conference started with Ken Wheeler discussing his favorite new features coming to React (memo, lazy, createContext, suspense) and dedicating most of the time to Hooks. Hooks let you use more of React’s features without classes and allow to write less code, but most of all, reorganize code to make it more readable. How to improve code reuse in React applications? Right after Ken’s talk, the stage entered Forbes Lindsay. 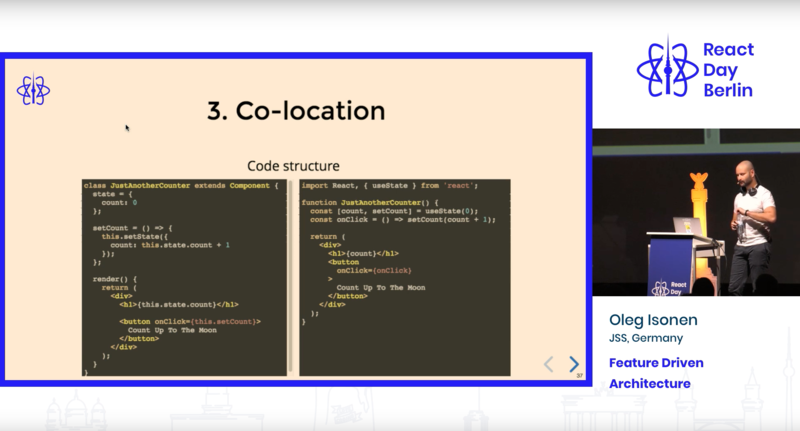 He presented how combining the context API and render props gives you unprecedented power to cleanly reuse code across components. Using functions as parameters allows highly customizable shared components, complete with state and lifecycle hooks. Context still uses the React tree. This means it works with server-side rendering and you can safely use it in parts of your app, as well as using it as a whole app solution. How to organize your React application architecture? Oleg Isonen come with insights from webflow on building complex applications. He presented goals and set of principles that help you to define the boundaries of feature-driven architecture. In Oleg's definition monolith is when the entire codebase is heavily interconnected. He brought as example popular default structure for React applications with a single folder for components, containers, actionCreators, and reducers. This way single feature is spread all over and everything is interconnected. As a solution, Oleg presented feature driven architecture where a feature is a self-contained user-facing reusable complex building block. In a way, code matches UI here. It is more high-level abstraction than a component, but smaller than pages or screens. There is an untold thought about shared abstractions: you can not trust even 100% unit test coverage - it can still break. Static types help a lot but still won't discover all problems. 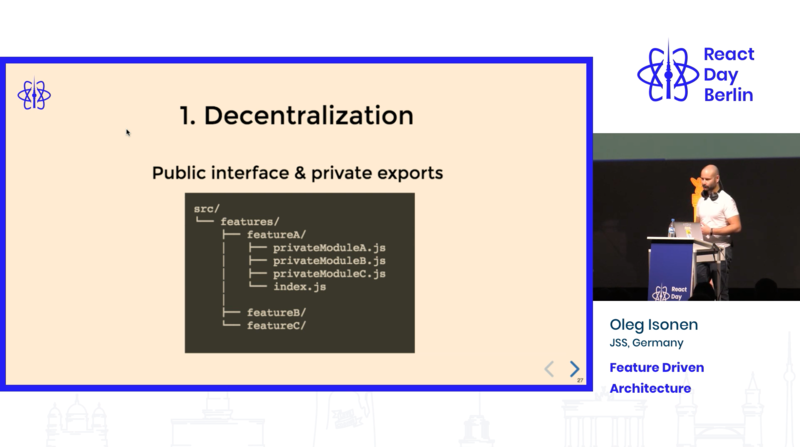 On top of the file system colocation mentioned in the first principle - Decentralization - you should also put together styles, images, tests, anything we can. This also applies to Redux store structure (i.e. with Ducks: Redux Reducer Bundles). Do not optimize for modification, unless you can predict the future. Instead, optimize for ease of removal, based on what you already know. At some point, everything is going to be a Mess so the only choice you have is to either refactor everything vs refactor isolated parts. 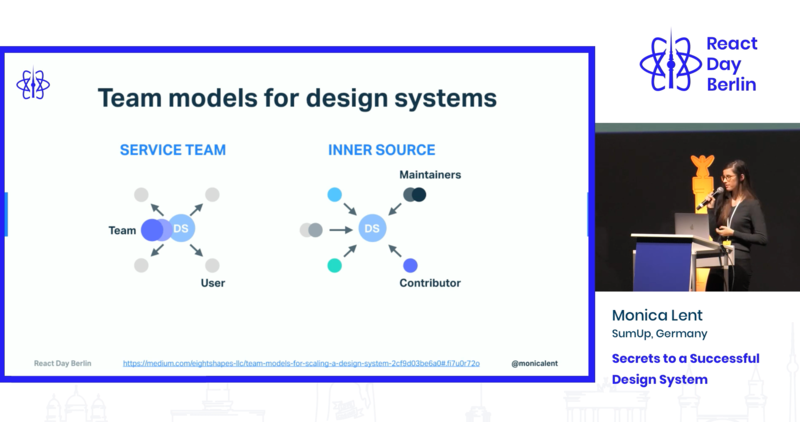 What problems does a design system solve? Before you build a design system, you do design audit. The result can be detected a lot of inconsistency in design. But the worst thing is that designers and developers have most likely have wasted a lot of time by trying to optimize all those inconsistencies. You get consistency as a side effect. You have to plan for it. Use platform-agnostic data that visual data attributes. Organize in a way that scales. People success is the system's success. Key KPIs for design system are Speed, Quality, Ease of Contribution and Completeness. Monica showed team scored hight their Circuit UI Design System which is build using docz The cost of the design system can be significant. Docz is appropriate for a design system or just simple project documentation. I would recommend considering Storybook as it can help you with Automated Visual Testing. How to write good tests? // 3. Assert on the results of step 2. Tests should have no external dependencies. If your tests can fail without any of the code you’re testing changing, your test is not properly isolated. An unrelated code should not break your tests. This is a huge cause of concussion and frustration in large code bases. Use mocks. They are an essential tool in a developers’ testing toolkit. It’s important that test data that resembles your real data. Use functions to create data for tests. There are libraries aka data factories. One idea that comes to my mind after this presentation is that you should use data creation functions and test their output against real data dumps - aka test your test data from the beginning of Jacks presentation. Check out my article on Testing React Components Best Practices. It covers tests refactoring patters in more details. When I change the code I have to change the tests as well, so all tests do is double the amount of work I have. If you write a test and it passes the first time, try to break it. Use small feedback loops. Red, Green, Refactor. Using Enzyme or react-testing-library does not matter as long as you write good tests following the above rules and you test like a user in a browser. BEM? SASS? CSS Modules? Styled components? What is best for styling? The conclusion of the presentation is that styling is hard. No one is wrong. No one is right. It all depends on what you use it. I liked this presentation because this topic is really often brought in projects. Now I have a clear answer: use what makes you code faster and better. Focus on what is really important: users getting value and the project sponsor making some money. Recognize breaking points in technology adoption. Consider how easy it is to transition to it? Is now the right time? Do you really need it? 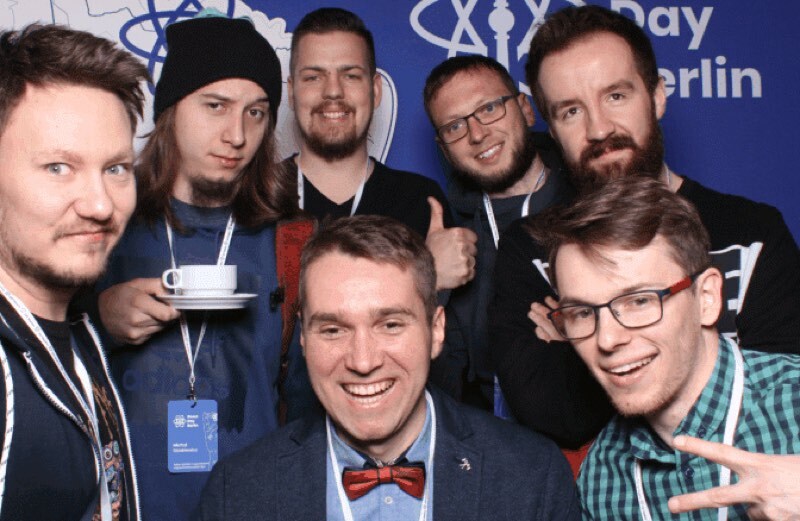 We really need more of conferences like React Day Berlin and we need a healthy approach to what we learn there.